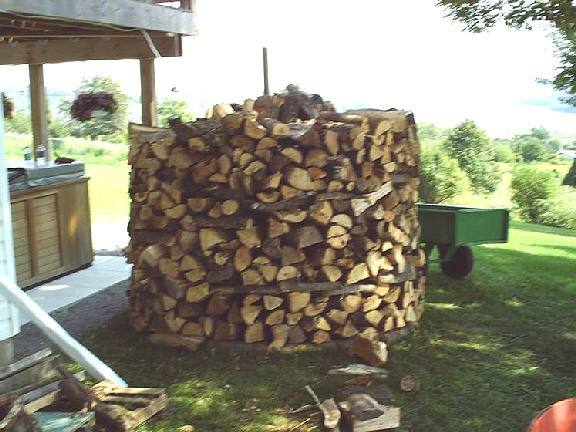 Our friend Pat is in the wood heat business and knows his way around firewood production. But when he tried to pile wood the way some people recommend, the firewood follies began. 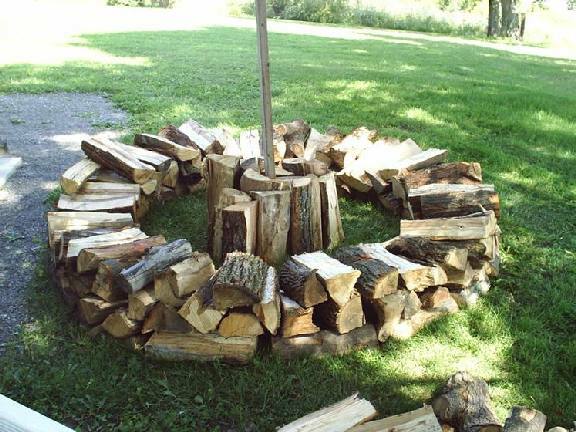 A Holtz Hausen is a European method of stacking wood that is supposed to season wet wood to dry in as little as three months. 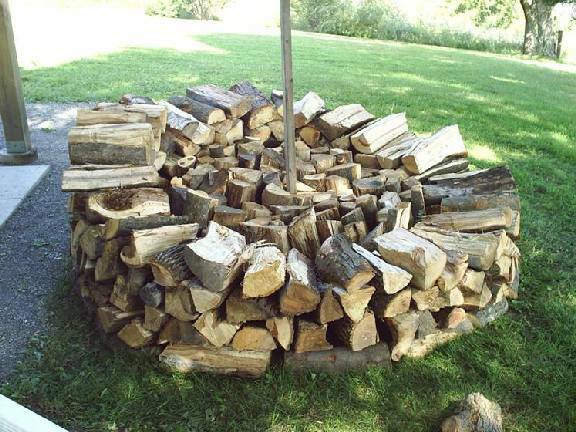 This method creates a “chimney affect” drawing air through the outer pile and up the vertically stacked wood in the center, creating air flow even with no wind present…..or so I read. Step 1 Drive stake into ground making a height of about 7’. Mark stake at 5’8” (wood will settle to expose mark when dry). Step 2 Lay circular row tipped toward centre of pile. Step 3 Starting around stake, stand wood in centre, building out toward outer ring. Step 4 Continue building, being careful not to get dizzy as you go. 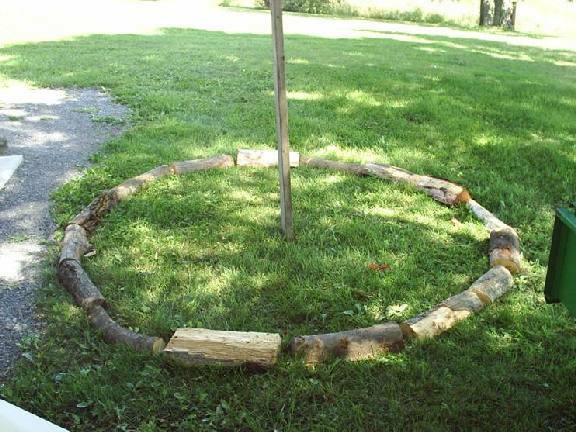 Step 5 As wood in outer circle becomes level, insert small pieces as in step 1 to keep wood sloping toward centre. Note red tape on center stake at 5’8” (top of picture). Step 6 Admiring my handiwork from the deck above while fetching a beverage. Hey, this is really starting to look terrific. Step…@*$^%)@!!!!! Ok…..dump the beer and seek out something harder like Rye, Vodka….whatever, curse, swear, stomp your feet, look for excuses as to why it fell down and go back to step 3. Oh yea….be grateful it didn’t fall on the hot tub!!! Don't you just love heating with wood?!!!! Ed. 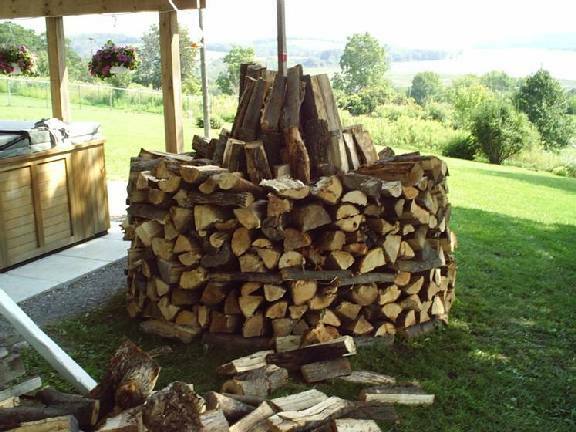 note: Some years ago a guy emailed woodheat.org and very forcefully told us that everything we said about stacking and seasoning wood was wrong and promoted the holtz hausen. I was dubious about the claim that the chimney effect would dry the wood faster. I wondered how a meaningful chimney effect was created without a temperature difference and how wood could possibly dry faster in an organized pile like that than in a windrow. I didn't want to challenge the guy without any knowledge, so I tried building one myself. 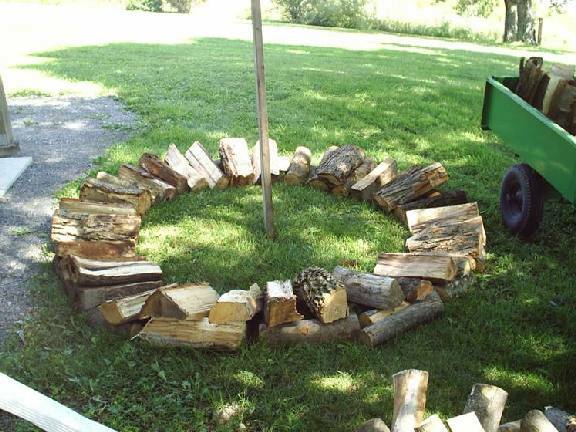 It was without a doubt the most awkward, time consuming, tedious way to pile wood I could imagine. I spent all my time walking around that damned pile and reaching into the center to place pieces. I threw in the towel long before the thing fell down. I went back to piling in windrows and haven't looked back. The lesson I take from this is that if something sounds too good to be true, it probably is, as if we didn't already know that. This page was only up for a few weeks when we received this from one of our visitors. I read the story of building a Holz Hausen and got nosy about this Holz Hausen thing. Being German myself, I never heard about it. 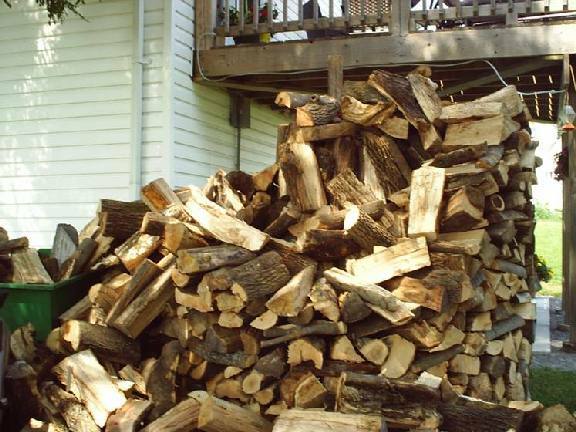 I searched in the net for a while and wanted to share the real info, so that not so many people believe they can dry firewood in three months! The name Holz Hausen doesn't exist! A Holz Haus would be a house built out of wood. 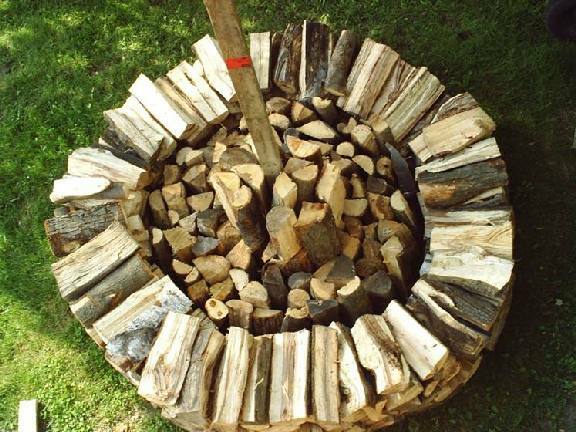 A Holz Haufen is just wood thrown into a pile. The right word for this structure is Holz Miete and they don't have a center pole. They are not drying the wood faster either. The web site www.holzmiete.de recommends, that the wood has to dry like this for a minimum of two years! It's just a space saving way to store wood that looks good! I hope you can post this message somewhere on your site and save the people a lot of hassle and wondering! P.S. This mail was sent to two more web sites to save people, lol. But it was really funny to read all the opinions and advices on the matter! !